[Satnews] The Polar Region has gained attention in recent years, specifically in the enterprise sector with the opening of sea lanes and opportunities presented by key industries such as oil & gas, mining and commercial airlines increasing the number of flights using the Polar route—tourism has, likewise, led to consumer oriented opportunities as the number of Arctic & Antarctic visitors rises annually. Yet, the region’s geography presents technical and coverage challenges for satellite operators that must assess the risks associated in launching capacity dedicated to serving the region. Economic conditions are likewise tenuous as exploration has diminished in the once highly promising oil & gas sector, which was a key market driver for satellite investments. 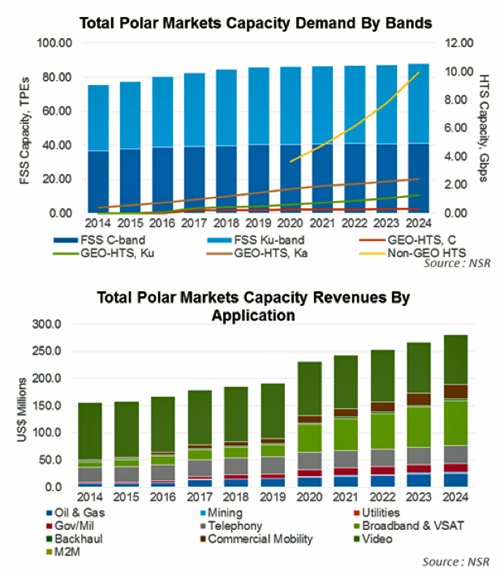 This industry benchmark NSR report assesses current and future Polar satellite requirements by application, vertical and by frequency platform, offering key insights for industry players looking to navigate and gain insights into the market’s future supply and demand potential. The report enables satellite operators, service providers and equipment vendors to anticipate market developments and assess their market position in both existing and new segments that offer either long-term revenue opportunities or a highly risky investment. How is the Polar demand picture per application changing and evolving? Should the satellite industry invest in the region or continue to regard it as an incremental or incidental opportunity? What is the “right” or optimal supply mix that best serve or maximize ROI over a 10-15 year period? Should the satellite industry evolve or provide a game change in order to spur growth and increase its competitive position within key applications? What are the revenue prospects per application and vertical? How are long-term pricing trends affected by the interplay of Polar supply and demand in a potentially changing landscape and solution mix? The detailed assessment of the Polar market relies on the latest results reported as well as input from key vendors that are currently the market leaders serving the Polar region. This provides a solid quantitative and qualitative basis from which a comprehensive analysis of trends and market forecasts can be drawn.